Ever heard about Pasir Putih beach? I’m sure you are or if you don't, I’m very happy to tell you about this lovely but simple beach. The place is easy to reach from the main road Situbondo-Banyuwangi, on the north coast of East Java. 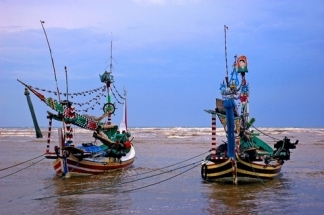 This is one of the nice beaches on the coast of Java beside Pangandaran and Pelabuhan Ratu. Yes, Java has also beaches, maybe they aren’t as famous as the beaches in Bali , but they are lovely with simple accommodation on the coast. It’s a little bit quiet, little crowd, more fishermen doing their job. Don’t expect any luxury here. This place has a simple facility around. It’s more like weekend place for the locale people to get out from their daily life. There are enough activities that you can do around here, swimming, snorkeling, diving, and if you like fishing, you can ask the fisherman to get you to the place where you can do that. They are experience fisherman. They know exactly where you have to go. And at the end of the day, if you’re finished with fishing, you can even bring your fish to the eat places; they will make your fish ready for the meal, pretty handy, isn’t it? It’s a lovely ending of the day, don’t you agree? From the beach you can hire a boat to see the sea garden, very nice place where you can do snorkeling to enjoy the beautiful sea life, coral reefs and colorful fishes. Or if you don’t want to get wet, you can also enjoy the beauty from the boat, the bottom of the boat is made from glass, so you can clearly see the beauty of the sea life. The common price to hire a boat for 1 hour is about US$ 5. There are a few places where you can stay overnight. A few simple hotels with affordable price. Just like Sidomuncul hotel which location directly on the coast. The rates per room range between US$ 12 and US$ 30. Or choose another hotel that more cheaply like Hotel Mutiara, the rate range between US$ 5 and US$ 15. It’s pretty cheap, isn’t it? And it’s worth it to spend the night here. Stay overnight here would be a memorable time, warungs and shops begin to live in the evening. In front of the Hotel Pasir Putih, on the side of the forest there are eat places which prepared the grilled fish, the sights is just cozy and it makes the warm feeling inside. Here is the place where you can get the long lasting memory of the fascinating evening.